1. God only loves that which is perfect. 3. Therefore, we are perfect. I'm just going off the top of my head here, but I definitely believe that the first premise is the one which is in error. I'd like a discussion of why Gaius' teaching regarding the monotheistic God on BSG is wrong. Now, considering that Gaius does not have a New Testament, what would it take for someone to demonstrate rationally that God does not only love that which is perfect? And the real question we as Reformed thinkers should be able to answer is, "how is it possible for God to love the imperfect?" Now, I have my own thoughts on this, and it may seem a tad simplistic to some, but I felt that this might make for an interesting discussion. Without Scripture to appeal to, can we answer this type of rationale? Come on, everyone; let the Thomist within you respond. If you were on the Galactica, what would you say to him? I am not sure I have an "inter-thomist." Every Van Til bone in my body screams that your question is bad. I cannot know what God loves or cannot love without him telling me. In other words, I need his Word to tell me this. Now, we know from his Word how to answer your question, but I do not think I can do it with out the Bible. And perhaps, this should not be answered without the Bible. Part of science fiction is that it gives us a strange window into our own world. It may be impossible to put away our presuppositions, but I don't think it's a bad question to ask what the people on board the Galactica should say in response to the claim that they are perfect. 1. I would point out that if we're all perfect, then why are our lives all frakked up and full of pain? 3. I would ultimately tell Gaius that I see no evidence [in the BSG universe, mind you] that God actually loves us. This is more what I was looking for, but I think there's still room for some discussion here. What I'm really saying is that on BSG, they don't live in a world where Jesus has come and born the sins of the elect. The New Testament isn't even a factor. Either the polytheistic religious leaders would need to appeal to their religious texts or use reason (as I'm suggesting) to prove that Gaius is in error. PS: I knew you would say what you said above. I love you. Baltar is claiming that the BSG-god loves us. Based on that premise he then assumes that BSG-god cannot love that which is not perfect. From this second assumption, he assumes that man must therefore be perfect. I know that is not how he gave the syllogism, but it had been previously "revealed" to him that the BSG-god loves "us." I think he is working backwards off that "revelation." Unfortunately, the BSG-god has left Baltar to figure out on his own just who this god really is. There has been no real revelation. Abraham did not simply feel a sensation from God to then be left alone to figure it out. No, God condescended to him and made himself known. The same with Moses, with the people of Israel, etc. Without revelation, we cannot know anything about God. Similarly, without some kind of revelation, the BSGers cannot know anything about their "god" either. 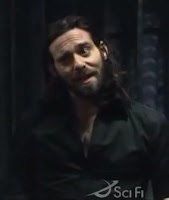 Yet another problem for Baltar is that he is setting himself up as a prophet, yet the force of his prophetic ministry has been himself and his own personality and intellect. There is no "thus sayeth the Lord," just, "this is what I have figured out." Of course, because this is a television show, the writers will be able to make it appear that the BSG-god does exist and that Baltar really is his prophet. For instance, he prayed for healing, and that boy was miraculously healed. So he will be able to point to signs and wonders. 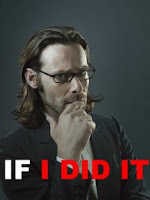 But it seems clear that Baltar's intelligence will play a role in his status as prophet: in other words, the BSG-god picked him because he is so darned smart. In the end, the religion of BSG will be about exalting man and human pleasure. Even if we assume that his god had decided to use Baltar's intelligence as a medium of revelation about his character, he still has the problem that his revelation doesn't really explain anything about reality. As you said, Adam, this "truth" doesn't explain the present situation of the humans. I suppose we can assume a Romans 1 kind of situation, where these people know that that the BSG-god exists yet they suppress that truth, and the Cylon attack is merely a Canaan-like conquest. However, this actually goes against what Baltar has revealed. If humanity is perfect, why then are the agents of God attacking and killing them? Is Baltar assuming that a human is only perfect when he begins to worship the BSG-god? Doesn't this contradict the premise that God is angry with people because they worship other gods (I seem to remember that imaginary cylon telling Baltar that at some point)? Sorry, just a few random thoughts on BSG religion. I would also add that the difference between theology and religion is that theology is the study of the nature and character of God, but religion is sociological - it is the study of man's search for God. On BSG, examining Gaius' religion tells us more about the people on Galactica and about Gaius than it does about the god of the BSG universe. I am curious whether the writers of the show envision a verifiable monotheism or polytheism. I am interested in whether either will be shown to be true or false. I suspect that we will never know which is true by the end of it all, but the monotheism sure seems to be winning out when you consider that President Roslyn's revelations and guidance have definitely fallen by the wayside. That probably won't last, though. I suspect we'll get something of a postmodern-type ending where no one really knows who is right, but both religions will seem plausible. If anything...you guys are getting me to want to watch the show. I hope this does get you to watch more BSG, Johnny! That is, unless you have more important stuff to do. 1. Loving only that which is perfect is an imperfection. 3. God does not love only that which is perfect. 5. It is logically possible that we are not perfect. I forgot to add a point to my argument. My argument assumes that there is something imperfect in the universe and it also assumes that the imperfect object be worthy of love. (When I say "worthy of love" I don't mean PERFECT, I mean something which because it exists God loves it.) Note, if there is nothing imperfect in the universe then it is not an imperfection to love only that which is perfect because God would have loved the imperfect were it the case that the imperfect existed. 1. There is nothing about imperfection that necessarily makes the imperfect object unworthy of love. 2. Thus the fact that an object is imperfect does not imply that it is unloved. 6. Thus, God might not love only that which is perfect if the imperfect existential object is worthy of love. 8. Therefore, it is logically possible that we are not perfect, because it is logically possible that we are the object described in premise 4, and because it is logically possible that God loves the object described in the 4th premise. Or if you don't like the last argument here's another. 1. God is the only thing in existence that is perfect. 2. God loves everything that he has created. 3. The created is seperate from the creator. 4. Thus, the created is not God. 5. Thus, the created is not perfect. 6. We were created by God. 7. Therefore we are not perfect. I don't like the second argument as much though, because I think it's easier to reject the 1st premise. it's simple. it's our imperfections that make us loveable. have you ever tried to love someone who was perfect? impossible. there's no entry. actually let me elaborate briefly. there's no *point* of entry. perfection is like a smooth, impervious surface. our faults make us permeable and make us need each other - not desire, not to consume, but to comfort, nurture, and protect, to pay attention. to give and receive there must be an opening, a space - a flaw, a vulnerability. "it's the emptiness of the cup that gives us the use of the cup." without need we cannot be filled; we cannot receive love, therefore, we cannot be loved. therefore, we cannot love that which is perfect. we can enjoy it, we can admire it, we can respect it, we can envy it, but we cannot love it.